As a Licensed Direct Entry Midwife in the state of Oregon, I have served the city of Salem, and the surrounding communities, since 1980. My introduction to childbirth occurred in the 1960’s while I was a student nurse at a teaching hospital. I found a lot of the medical intervention that was considered necessary at that time to be very frightening, so I determined to spend my career finding a better way for women to give birth. 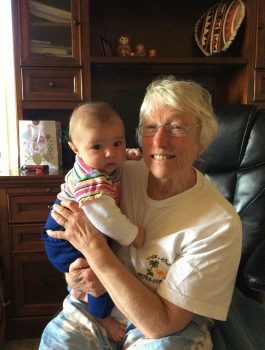 After graduating from nursing school in 1968, I spent several years teaching childbirth education and assisting a chiropractor that was doing births in his clinic. In 1974 I became an obstetrics nurse at a small hospital where I was given even more responsibilities, and was able to learn how to handle a greater variety of circumstances involved in the birth process, and to improve my skills in labor management. In 1980, I began assisting a few friends and relatives who chose to give birth at home, and I realized that I was ready to fulfill my true calling, that of Home Birth Midwife. Since then, I have attended hundreds of births, and each birth teaches me something new. I still find my career to be stimulating, uplifting and fulfilling. I am enjoying delivering many second generation babies in the Salem area. I am married with four grown children, and six grandchildren, some of whose pictures compliment these pages. The third oldest of eight children, I was raised on a small farm in Salem, Oregon. In 2008 I attended my first birth as a Doula and I was so mesmerized by the beauty of birth! During the next 9 years while working as a professional Nanny I assisted at a few more births and in 2013 I jumped into the Birth world with full enthusiasm. I am a certified Birth Doula through DONA International and have been a birth assistant to Betty Griffith, LDM for over 3 years. Assisting at over 100 births, my experience is in a wide range of births from Home Births and Conventional Hospital Births, to Birth Centers, VBAC’s, multiples, and Breech deliveries. I enjoy staying active by participating in local sports and outdoor activities such as; biking, hiking, camping, and boating. I have been volunteering at a local pregnancy clinic for the past 8 years and immensely enjoy working with pregnant women, learning with them about natural ways to improve their health, and getting ready for their birth experience. My journey into midwifery began with the birth of my third child, my first homebirth with Betty Griffith. The difference in care was life changing and had such an impact on our family, I knew then that one day I wanted to care for women in the same way. That was over fifteen years ago and I am honored to now be working with her. 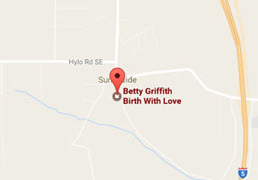 I am in my second year of assisting Betty Griffith, LDM and have cared for women at more than fifty births. I received my doula training at Birthingway College of Midwifery and have served as a doula or assistant in a wide array of situations and settings, including multiples, breech, VBAC and serving as doula through planned cesarean births as well. I am also a certified Childbirth Educator, Placenta Encapsulator and have received education in Lactation Counseling. Currently, I am pursuing my Bachelor of Science in Midwifery. Outside of my work with Betty, I am available for private doula clients as well as placenta encapsulation services. In my free time, you will find me hanging out with my husband, our eight children, and precious granddaughter and daughter in law, either on an outdoor adventure or with our feet kicked up and everyone on their favorite instrument and singing along.